A light, easily absorbed and gentle everyday moisturizer for babies and toddlers. With the beneficial properties of Calendula and other natural ingredients, it creates a protective layer around the child and soothes delicate skin. Gentle almond and jojoba oils leave the skin soft and supple. 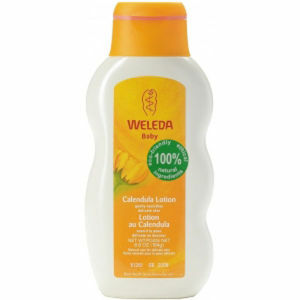 After a bath, apply Calendula Lotion to your baby’s entire body and gently massage in. The lotion will absorb quickly into his/her skin. Water (Aqua), Jojoba, (Buxus Chinesis) Oil, Sweet Almond (Prunus Dulcis) Oil, Alcohol, Glycerin, Glyceryl Oleate, Calendula (Calendula Officinalis) Extract, Sodium Beeswax, Fragrance (natural essential oils), Xanthan Gum.